A wonderful and simple way to support brain health, and bring balance to your day; at your desk, altar, or in sand play. Trace with any pointed object, and allow the pathway to gently guide you in and out again. 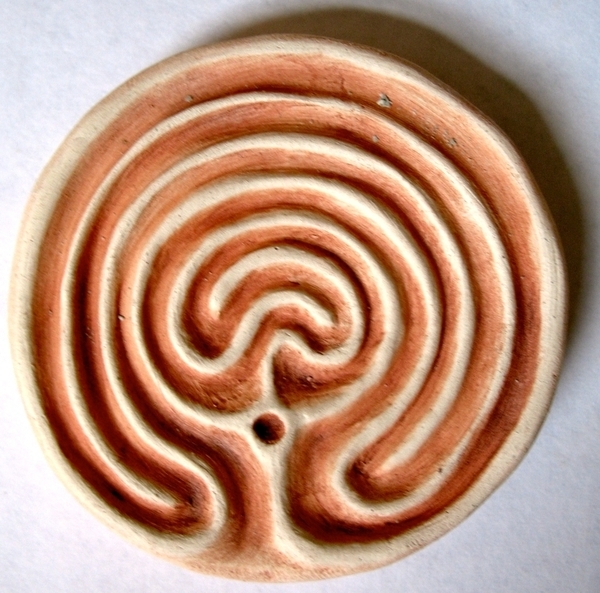 This fits in the palm of your hand about 2"
"To walk or trace the labyrinth is to create balance within one's brain as the soul seeks to restore electromagnetic polarities by connecting the mind and heart. A labyrinth is an ancient symbol that relates to wholeness. It combines the imagery of the circle and the spiral into a meandering but purposeful path. It represents a journey to our own center and back again out into the world. Labyrinths have long been used as meditation and prayer tools."